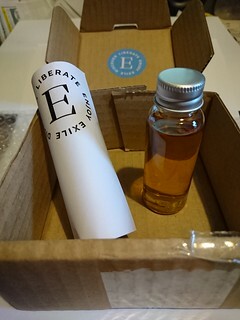 Those very nice chaps at Exile Casks sent me a sample bottle of their latest release, The Wanderer. The nose is a big, joyful bundle of flavours. A hint of PVA glue first, then vanilla, cinnamon and orange peel, a freshly opened pack of currants and finally in the background there are hints of liquorice, sandalwood and camphor wood. The mouthfeel is decent with a little cling, and quite drying. The body has vanilla, cinnamon, hard toffee, dried apricot and artificial peach flavouring, then a hint of the exotic woods that were in the nose. The finish is long, but dry - dried apricot and vanilla with a hint of cinnamon, camphor wood and orange peel. Water brings out thick, exploding whorling that lingers for an eternity at the bottom of the glass. Truly joyful for the viscimetrists amongst us! The nose now has no trace of the PVA glue, liquorice or the currants - it's vanilla ice-cream, apricots, orange peel, lime-flavoured Opal Fruits (Starburst? What's that? ), kiwi fruit, hard pears and red apples - and just a hint of pine-scented air freshener. The body has similarly opened up - no liquorice, less toffee, and the orange peel and lime hints from the nose have joined the apricot and peach for one hell of a party. A faint hint of pine sap and a touch more of those exotic wood notes than before, but then it moves nicely into the finish - which is not quite as dry as before, and has gained hints of oranges and red apples.